This is a nice starter or, if you build it a little further, a light meal. Preheat the oven to 200C. Defreeze your sheets of puff pastry and cut the taleggio in pieces, big enough to fit inside a puff pastry package. Place the Taleggio on the pastry, season with thyme, rosemary and pepper and fold it to close. Bake the pastry packages until golden and crisp (about 20 minutes). Wash and dry the lettuce and put the leafs in a salad bowl. Put all the ingredients for the dressing in a jar and shake until emulsified, adjust seasoning to taste. Just before serving, cut the apple in small pieces and mix them in the salad. 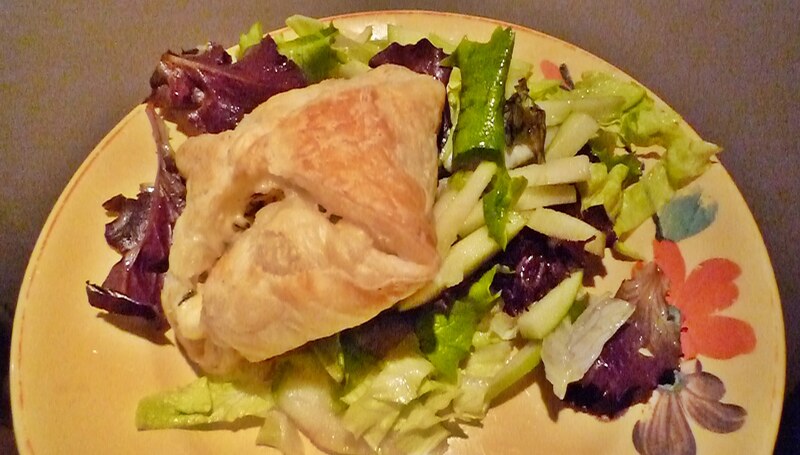 Serve the salad with pastry packages on top. 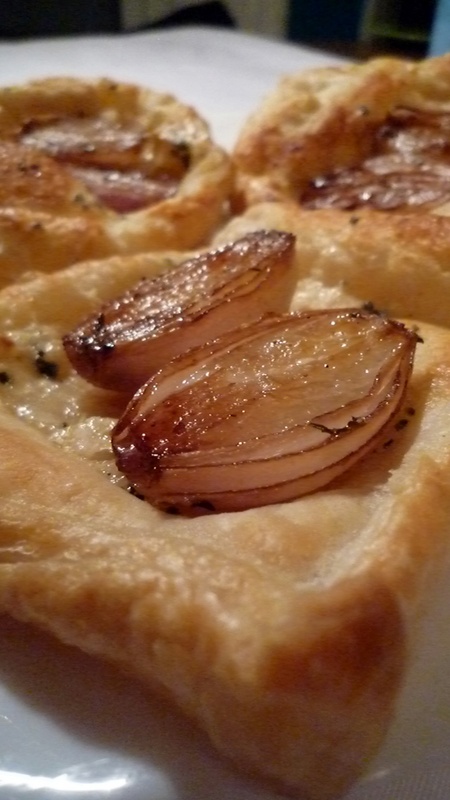 If you have ready made puff pastry in your freezer or fridge these galettes are easy made bites. With a little salad next to it, they can serve as a starter. I still use the premade pastry to make my quiches and galettes but I will try to make my own some time soon. It is just more convenient to make these things in large quantities and I don’t have a freezer to keep it in. But enough with the excuses, the next short crust pastry of puff pastry recipe is going to be a homemade one. Clean the shallots and cut them in half. Warm oil, balsamico, honey in a pan and place the shallots in this mixture with the cut side down, season with pepper, salt and the dried thyme. Cover with a lid and let this stand on the lowest fire for about 15 minutes, if you think they are getting to dark without being soft enough, just add a little bit of water. Place the pastry on a baking sheet and cover with little chunks of blue cheese. When the shallots are soft and the cut side browned, place them with the cut side up in the middle of the pastry, roll the edges up. Bake in the middle of the oven on 200C until golden brown.